You are going to Watch Naruto Shippuden Episode 355 English subbed online free episodes with HQ / high quality. 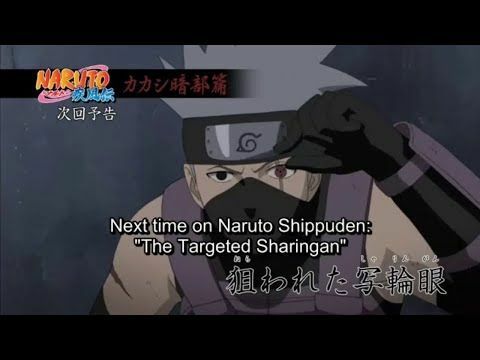 Stream Anime Naruto Shippuden Episode 355 Online English sub The Targeted Sharingan. Danzo orders Kinoe and Kinoto to retrieve Kakashi’s Sharingan to replace his right eye due to it beginning to fail. At the same time, found by his subordinate Yugao Uzuki at the Leaf Village Cemetery, Kakashi is summoned by Hiruzen with a mission to investigate one of Orochimaru’s hideouts. There, Kakashi encounters Kinoe who accompanies him before eventually revealing his actual mission. This turns into a fight with Kakashi reluctant to kill a comrade despite Kinoe ultimately brings up the fact that Kakashi had allegedly killed a friend of his. But pinned by Kakashi to the ground, with the war hero’s Chidori primed to deal a fatal blow, his words finally reach Kinoe as he remembers his past and induction into Root while resigning to his fate as he tells Kakashi he can kill him if he wishes. All the while, a menacing creature looms over the two young men from within one of the giant cylinders.